Whose handsome kitty is this? Just had a visit from a wonderful little cat in my Columbia Park back yard. This guy is super cuddly, looks very healthy, makes a lot of noise and REALLY wants to get in the house to visit the other cats. 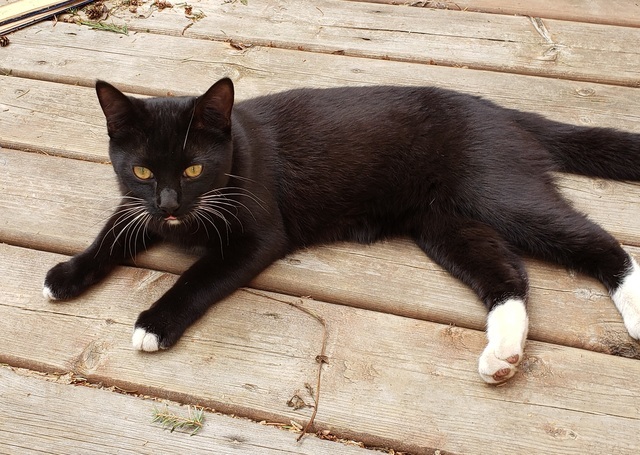 No collar, white boots on back legs and a little white soul patch, whiskers and chest patch. Just wanted to say that whoever the owner is has a really nice looking cat, but you might consider neutering if you're gonna let him outside because he's packing a magnum set of balls and seems pretty friendly to other cats.